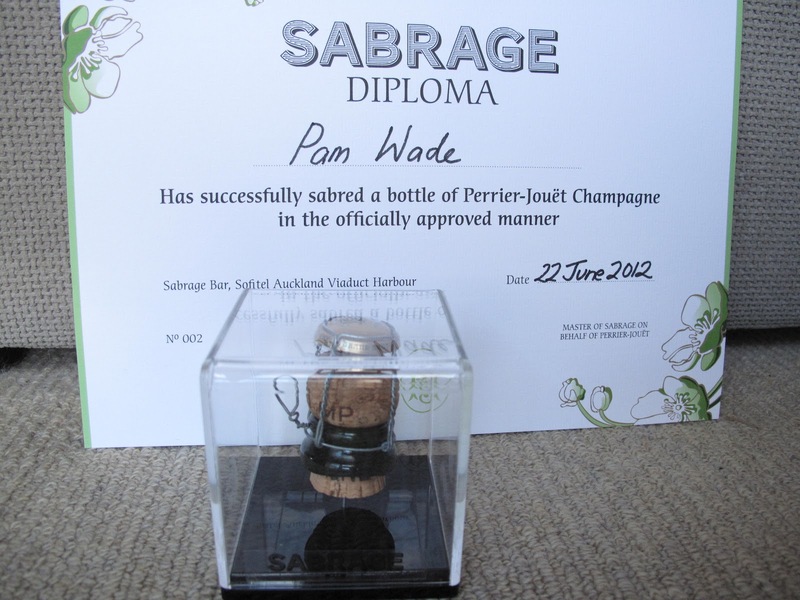 Sabrage: who knew there was a word for it? 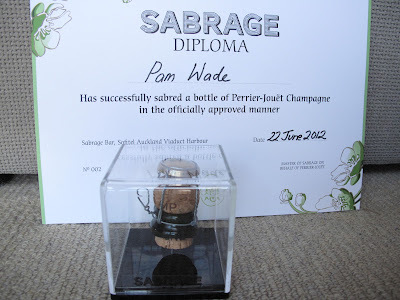 It's the act of removing the top (not just the cork) of a champagne bottle with a sabre, and the story goes that it was Napoleon (of course) who initiated the custom in the battlefield, saying that after a victory, you deserve champagne, and after a defeat, you need it. I saw it done last year in Macau with lots of smoke and mirrors - well, palaver, anyway - but today I discovered that it's actually very simple. Gerard showed me, with no fuss, how to reposition the wire around the cork, rotate the bottle so a seam is upwards, and then just slide the back of the blade up to hit the neck. I have a broken shoulder, remember (still sore, about to get the decision on surgery, thanks for asking) and therefore no strength, but it didn't need any. Just consummate skill, which you can see from the photo I had every confidence that I possessed. 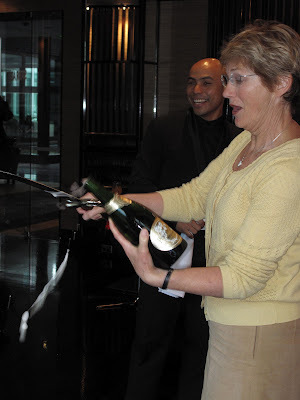 The top shears off cleanly, no slivers of glass anywhere, there's a brief fountain of foam, and then everyone gets stuck in drinking - nice dry Perrier-Jouet at the very classy Sofitel at the Viaduct in Auckland, just re-opened after a previous existence as a (spit) Westin. The lunch was delightful, light, fresh and tasty, and beautifully presented by the young chef Scott, recently poached (what else would you do with a chef?) from Huka Lodge. The sun was shining on the harbour and all the fancy boats moored just outside the restaurant, the company was good, and I'd just swiped the top off a champagne bottle with a sword. What more could you ask? UPDATE: Your orthopaedic surgeon to say no operation required, that's what. Great day!